The job of running a print business is about getting a group of people to execute daily in a manner that leads you to your strategic goals. One of the tools in our work toolkit is meetings. Recently one of my favorite writers, Seth Godin, wrote this blogpost about meetings which I find very helpful. Whose meeting is this? A simple checklistCan your next meeting (not conversation, not presentation, but meeting) pass this test? The time allocated matches what’s needed, not what the calendar app says. There’s a default step forward if someone doesn’t come. There’s no better way to move this forward than to have this meeting. The desired outcome is clearly stated. The organizer has described what would have to happen for the meeting to be cancelled or to stop midway. “This is what I want to happen,” and if there’s a “yes,” we’re done. All relevant information, including analysis, is available to all in plenty of time to be reviewed in advance. If you score a seven, count me in. In some business cultures, the reaction to almost anything is to call a meeting. So many meetings are not necessary. So many meetings are poorly executed. So many meetings frivolously spend the most precious resource in your business—time. Meetings are expensive. They are a gathering of multiple people who all are getting paid to sit there. When you waste time as an individual, you waste one person’s time. When you call for a useless meeting, you are wasting at another level. Some people think meetings = work. It doesn’t. Not much work typically gets done in a meeting. Meetings are really for getting alignment around what work needs to be done after the meeting. When you’re in a meeting, you aren’t working. 1. The meeting participants are looking at their phones. I want to leap out of my seat and throw the phone out the window—seriously. This is especially egregious if I personally spent more than five hours on a plane to attend the meeting. If the meeting isn’t important enough for you to stop looking at your phone, you should not attend. If you are looking at your phone because the meeting does not apply to you, you should leave and get some real work done. If you are so important that you must be in constant text/email/snapchat communication, then you’re clearly too important to be in the meeting in the first place. 2. There is no clear objective to the meeting. This is the most common; meetings are called because people don’t know what to do next, so they call a meeting as if that counts as a step forward. People are resistant to structure or setting an agenda, and many think it’s better to have an open conversation. This is good if it’s a Saturday and you’re with friends and family, but is a bad idea in business, especially if you’re inviting the most important people in your company to the meeting. Time is money. You should calculate the costs of having people in meetings (per 15-minute increment)—it will upset you. If you’re working with consultants, it will haunt you (and I’m a consultant)! 3. Nobody is in charge. This hurts the meeting on multiple fronts: where to start and how to end it. In my company we follow the Agile Development process strictly, that means for each software development project we have a daily “standup call.” Why is it called a standup? It shouldn’t require you to sit down—it is designed to be short so we can all get back to work. The idea of the standup call is for everyone to check in on what they did yesterday and what they plan to do today. This is a series of very succinct updates, with the occasional “I’m blocked on this issue and need help discussion.” The structure of the meeting is held by the meeting leader “called a scum master.” What’s great about these meetings? They are short, they keep everyone on the same page and, most importantly, they are formalized peer pressure. Everyday, you are forced to report what you accomplished or didn’t accomplish publicly. You would be amazed at the compliance this short daily meeting creates. 4. Starts on time, ends early, technology works. 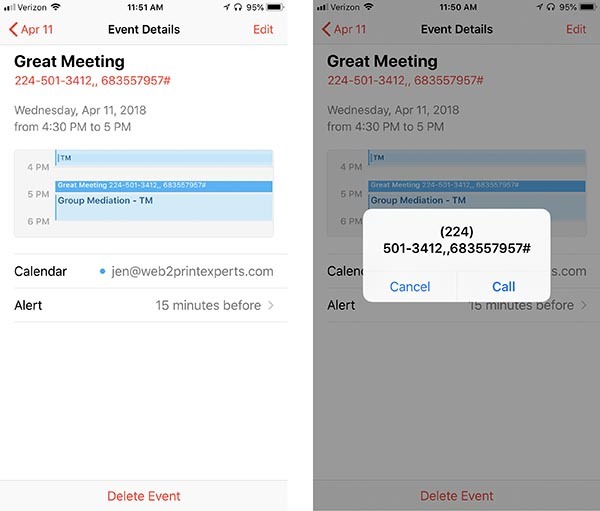 The people attending your conference call don’t need to remember the code; they just click on that format—it dials the phone number, pauses, and then dials the code. Do not forget the “#” sign at the end, which is almost always required to get you into the conference call. This is again about valuing people’s time. When you’re meeting with your customers, this is even more important. The most precious thing you can spend is your customer’s time. 5. No meeting was necessary. Most meetings are not necessary. I’ve found that the business cultures that have the most meetings are the ones with the weakest leadership. When there is a lack of leadership, nobody feels empowered to move without consensus. This kills productivity. Leadership means making decisions; when there is a lack of leadership, decisions take a long time and are over-vetted. When there is strong leadership, people know the direction, people are held accountable, and people do their work without having to ask everyone’s permission. If you have a lot of meetings, you should look at whether you have truly created alignment about what’s important and who is tasked with making decisions about those important topics. Without that structure, businesses will meet and meet and meet, all the while thinking they are getting something done when really it is a culture of activity instead of results. People can look very busy and be very tired and still be getting nothing done.